Alex Sewell, Tangerine Tank. Courtesy TOTAH. TOTAH presents an exhibition of paintings by Alex Sewell in Hookey, from September 7 through October 8, 2017, with an opening reception from 6:30 to 8:30pm on Thursday, September 7. In his most recent works, Sewell plays hookey from death: Kurt Cobain, Janis Joplin and Brian Jones’ tombstones gather dust, while Cobain’s grave wears a Daniel Johnston “Hi, How are you” t-shirt, a nod to Sewell’s own passage across the zodiac threshold of Saturn Return. (1) In the eponymous portrait, the painter considers the importance of “gracefully defacing” and continues his tongue in cheek critique of all things taken too seriously, crafting caricatures of our demons, our egos, and everything in between. Sewell channels visual tropes from gaming lore and popular culture into oil on canvas and wood (his technique honed as an assistant to Jeff Koons) and plays psychological trompes l’oeil. Show me my opponent, a wooden Excalibur embedded in a clearly labeled “ROCK” lures our hero complex in. “Young boy comes across sacred object. Saves world through altruism and violence”, intones Sewell, mocking this trope. Hero complex and artist syndrome sound astoundingly alike: King Arthur’s retrieving of Excalibur not so distant from Raphael and Michelangelo’s crawling into the grottos of Nero’s Domus Aurea, nor from their engraving of signatures into its frescos, and neither the least bit remote from Basquiat’s tagging of New York City walls with his crowns. In vivid liquid-crystal color, Sewell conflates human form, sports equipment, machines of war, urban legend and mythology. With a wink of humor, he dives deep into the subconscious, and forces a collision of beat ‘em up figures, sketched from the naïve understanding of youth and flattened across fore and backgrounds. Sewell’s landscape is splattered with the bodies of Krang and with Nintendo graphics; it’s a land where the absurd and the grotesque converge, and where the tools of boyhood and adolescence play within other worlds of play. Tangerine tank (2) draws up the question of our instinct for violence as it co-exists with innocence—aggression imminent even in young children. 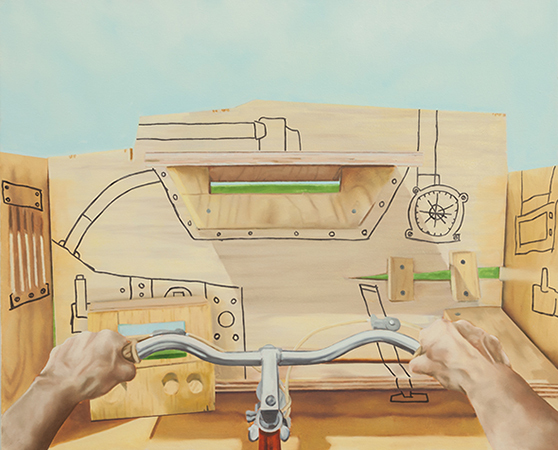 Painted in second-person perspective, it is the viewer’s hands on the handlebars and our own bodies enclosed by a wooden console, tricked out with benign gauges and make-pretend devices for navigating imaginary terrain. From Superhands to Street Fight Man, Hookey teases our primal impulses, alternating between the need to play and the urge to battle, ultimately provoking the public to reflect on our own psycho-scape. (1)A Saturn Return is an astrological cycle that brings either great personal transformation or death, as it has for many members of the 27 Club, the fraternity of musicians whose demise coincided with their 27th year including Cobain, Joplin and Jones. (2) The title of this work is borrowed from Led Zeppelin’s song Tangerine. Hours: Wednesday–Sunday, 11am–6pm and by appointment. For information and inquiries, please write to us at info [​at​] davidtotah.com or call T +1 212 582 6111.